Used to be the kitchen was a hardwearing, hidden-from-the-rest-of-the-house space that was all about utility, nothing about attraction. Today’s kitchens look as good as they live, especially when a few glamorous touches are thrown in. 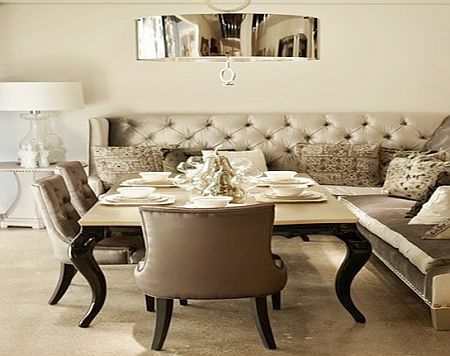 “Luxe textiles and reflective pieces add excitement to contemporary interiors,” said Houzz. And that’s never been more true than in today’s kitchen. Just witness the return of brass, now being seen in fixtures, finishes, and even appliances. For warmth and luxe factor, it doesn’t get much better than the antithesis of cool stainless and brushed nickel. Check out these glamourpuss kitchens and tell us you’re not ready to up the luxe quotient in your kitchen. Glam doesn’t mean overhauling your whole kitchen. 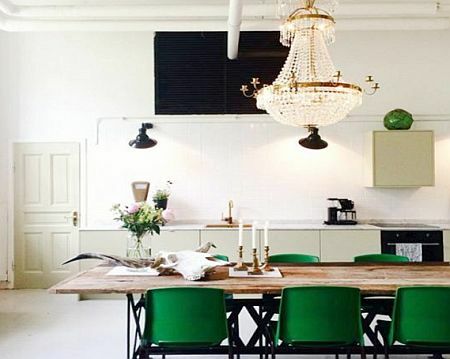 Sometimes, one spectacular chandelier is all you need to transform a space from “Just OK” to “Holy cow.” A gathering of modern Kelly green chairs doesn’t hurt either. If you’re looking for one spot to start in glamorizing your kitchen, lighting is a good place to start. 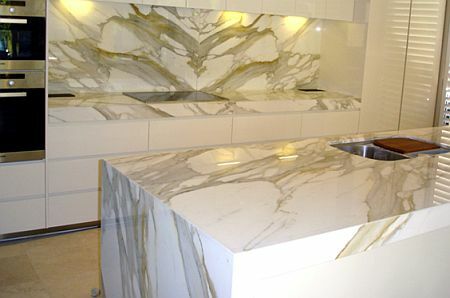 It doesn’t get much glam than a room full of Calacatta marble. Don’t want to update your counters or your lighting? Modern tin ceilings bring in a little shine from the top down. It’s all in the details. 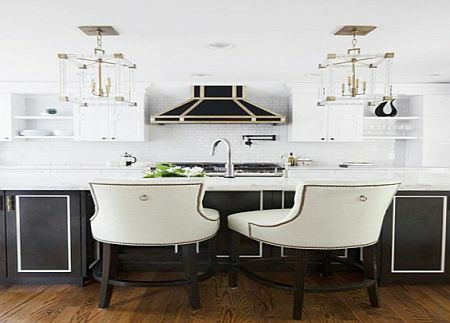 This kitchen featured in Domaine takes showstopping lighting and pairs it with a contrasting paneled island and uniquely detailed range hood. 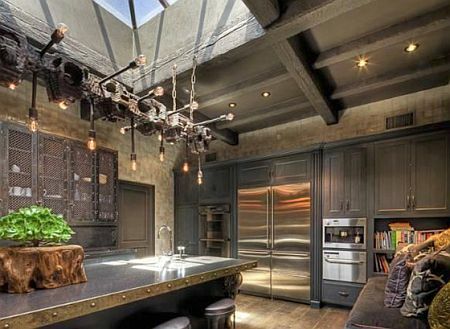 You can also achieve glam status without baubles and reflective surfaces, as proven by this modern industrial kitchen, which happens to belong to actress Hillary Duff. The loft-like space’s hard edges are softened by the plush seating. Speaking of plush fabrics…a banquette can be utilitarian or it can be luxurious. Or, it can be both. The curvy lines of the table legs and chairs and the sleek modern light fixture overhead create the ideal space for dining and relaxing.